I have a lot to thank the world of babywearing for; friends, visiting wraps, camaraderie, geeky chitchat. What I didn’t expect was a greater appreciation of…me. I recently received a LikU tester from Oxana. LikU is the diffusion line of Linuschka however it doesn’t seem to be skimping on anything – same mill, seamstress, with the same deeply rooted and local artistic aesthetics as Linuschka. The only difference will be a wish to maintain regular stock of LikU. I applaud this as it makes high quality wraps equally available to all. Oxana had sent a tester of the Bats design which is a Paul Bürck (1878-1947) illustration. Bürck was one of the founding members of the Darmstadt art collective that spearheaded modern interior design during the Art Nouveau period in Germany. He later became a freelance designer. Oxana must have adored plundering the archives to find the designs she has brought to life in the LikU butterflies and bats testers. She has retained this period feel in the cats tester designed in-house but inspired by her research. This lavish attention to detail for producing feast-for-the-eye designs is what appealed to me about LikU. Too often the ‘secondary’ range plays second fiddle with often basic imagery that is divorced from the mainline style – that goes for both wrap companies and fashion houses. Somehow wrap producers seem to imagine those wanting more affordable, in stock, wraps go for simple designs or possess slightly hippy vibes. 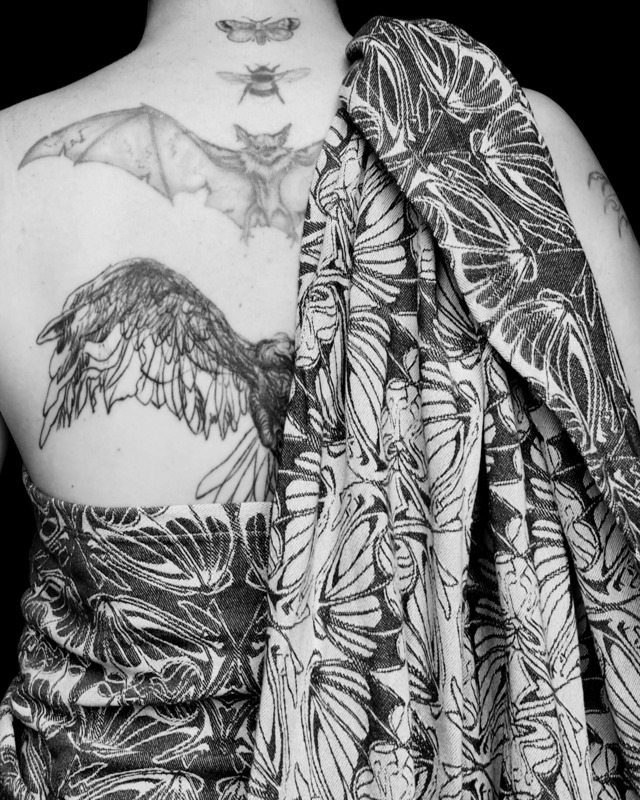 She had asked me to “show the bats with your bat” to which she was referring to the large black and grey bat tattoo that spreads across my shoulder blades. I hardly think of the bat because it has been there for maybe 17 years. A little faded perhaps but it has stood the test of sleeping on my back. It is top and tailed by an eagle from an Alexander McQueen sketch, a bumble bee taken from a 19th century drawing and a moth from a similar period. They line up, wings spread. I am drawn to the concept of flight, the ability to either drop everything and disappear or the possibility of soaring high above the minutiae of daily life. As a child I dreamed of flying and I smiled when my eldest daughter recently told me she was “absolutely positive” she could fly as she star jumped off the rocker board. The bat came from an Alchemy Gothic necklace that I wore every time we went to Rockworld (RIP) and spent the night dancing to the likes of Nine Inch Nails and Rage Against the Machine. I was a Goth; swathed in black lace, teetering in thigh high stiletto boots and hoicked in with steel boned corsets. Fabric as camouflage and identity altering is not lost on me. It was a time when I was still embroiled in a battle with my body and it was a battle that raged for years before and after. I experienced a split of the mind and body early on and this made it easy for such a war to be waged; one cannot hurt what isn’t really oneself. Eventually the war waned and with pregnancy it finally rested because for the first time I felt a harmony and a sense of pride in what my body, what I, could achieve. A mother to two girls I am acutely conscious of the self I project to them and it has led me to think about ways to show me, as me…to try and quell the voice that says you are not good enough. One expression of this has been through photography – the daily act of uploading at least one – usually babywearing related – image to Instagram. It is an act of creativity, power and passion to me. It also marries up well with a deep love for all things fabric and fashion related. I therefore haven’t been frightened to use myself as a canvas when photographing these woven wraps as they afford similar camouflage to clothing. I pose that anyone claiming wraps are merely functional pieces of fabric are denying the sensuality and artistry that the beautiful yarns and designs speak of. Such elements invite a playfulness and enjoyment that a selfie as I carry on the school run doesn’t fulfil, not for me anyway. I have taken a fair few playful images; those that are just me and a wrap. Doing so is another experiment with identity, trying on different selves, but they are all me and I am not trying to fly away now. There was a period when I was aware of a cattiness that exists in the babywearing world in some of the responses to the images. I had to remind myself these were grown up women and obviously struggled with themselves. Plough on Eleanor, pay no mind. 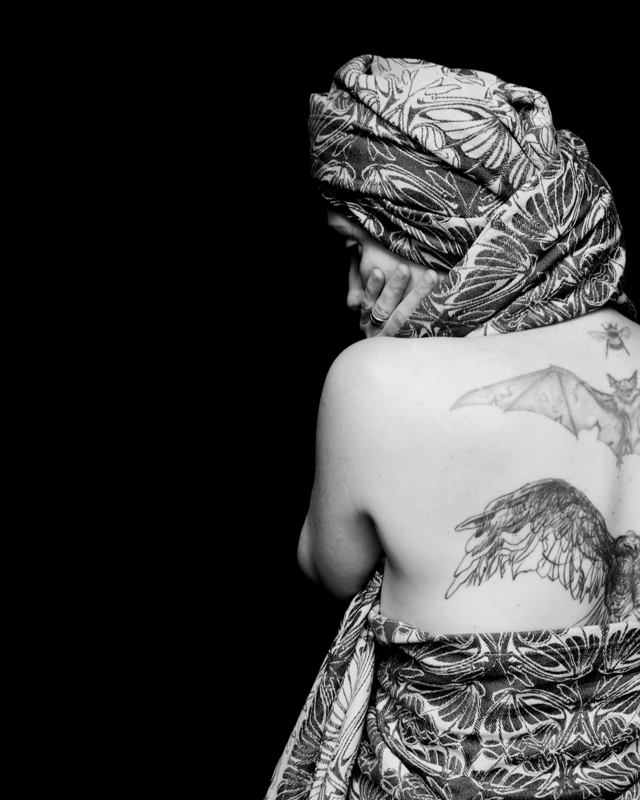 When Oxana asked me to photograph the bats with my bat it was a challenge I was happy to accept. I wanted to embody the lush, dark and flamboyant drama of Bürck’s design whilst sticking to my own, gothic, style – once a Goth, always a Goth. As I took the photographs and later edited them I had a single line repeating in my head ‘I have a body and I am not afraid to use it’. I used to hide from the camera; shroud myself in clothes that gave no hint of what was underneath or were so defining they were an armoured shell. During this time of motherhood and carrying my children I have come out of that shell and I promise my girls never to return to it. So if I had to sum up my thoughts it would be to say ‘play, enjoy the you that you are; look into the lens* and own it’.